Imagine you’ve gone to L.A. on business. Nothing exciting. Just a conference in one of those soulless hotels near the airport. You sneak a moment away and find a coffee shop. You just want to sit for a moment, relax, and take in that SoCal vibe. As you’re sitting there, you see a man walk in. Your jaw drops open. It couldn’t be! Is it? It is. It’s the guy you watch every week on your TV screen. Your favorite celeb crush of all time! He strides up to the counter, orders a coffee, and looks around him. Then he sees you. His eyes widen. He freezes. Oh no, you think. You’ve spilled something on your top. You glance down, hoping to sort out whatever he’s spotted before you embarrass yourself even further. But when you look up, he’s at your table. Introducing himself. Asking if he could sit down. Two hours later, you’ve missed all your meetings but could care less. He wants your phone number. He wants to know how he can see you again. All love affairs start with magic. Meeting each other out of the blue. Seeing each other as if for the first time. A shudder of unbearable excitement. In that giddy swirl of love, lust and hope, it’s impossible to imagine you’ll ever feel differently about him. If anything, you’re sure your love will grow even stronger. You’ll never be able to look at this man and not swoon in happiness. Being with him for the rest of your life would be like buying a winning lottery ticket. A lifetime of joy and bliss. Even if you find the perfect guy and have your dream wedding, getting married will only make you happier for a short time. At some point, you’ll return to feeling just as satisfied (or unsatisfied) as you were with your life before you got married. They’re basically saying that no matter how amazing your future husband is—even if he’s your favorite celeb crush of all time—you’ll get used to him. You’ll forget you ever woke up by his side thinking you were in a dream. He’ll become … dare I say … normal. I think most of us find it hard to believe we could ever take our dreams for granted. What if you won the lottery? Wouldn’t that make you happier for the rest of your life? Nope. Not according to the research, at least. No matter what happens to us—good OR bad—we become accustomed to it. We return to our baseline level of happiness. That could be a downer, if you think happiness lies in the future. But I prefer to see it as a great incentive to practice happiness now. Don’t wait for happiness to happen to you. Go out and grab it! Then, when Mr. Dreamy walks into the coffee shop where you’re sitting, you’ll know exactly what it takes to keep the excitement from fading. 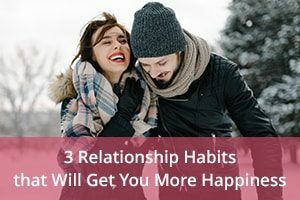 Here are 3 relationship habits that will get you more happiness now. Let’s say your favorite thing ever is to snuggle on the couch with your guy and watch something on Netflix. Should you do that every night, to maximize your pleasure? In fact, one of the quickest ways to take the pleasure out of something is to do it all the time. Mix things up a bit. One night, go for a stroll. Another night, invite friends over, or break out the board games, or do anything as long as it’s different. The thrill of novelty makes comfort so much sweeter. It’s tempting to hunker down with your guy in your very own love cave and cut off contact with the outside world. But don’t stay in there for long. Socializing with other couples is a proven way to boost your happiness. When you look at the face of the man you love every single day without fail, you can stop seeing him. You know what he looks like. Why would you have to look twice? But lovers gaze at each other and can’t look away. There is something pleasurable about memorizing every nuance of each other’s face. You don’t have to end up with a TV star to enjoy gazing at your guy. But it’s a habit you may have grown out of over time. Get back into it. Gaze at him again. But what if when I look at him, he hides his face? My bf truly doesn’t seem to want me looking at him. We have a great relationship & all but I still am always looking for ways to keep things fresh & alive. But it is hard to do when simple things like this that he isn’t willing to try. Thanks for all your advice & hard work. I truly love reading your blog & articles. I know that must be hard for you. I wonder, has he always avoided eye contact? I think you could benefit from a bit of back-and-forth dialogue about this with one of our relationship coaches. You should consider joining our Irresistible Insiders Club with a members only private forum. Well, he will look me in the eye if we are talking or something. But say we are laying in bed & I just happen to be looking over him, it is almost like it embarrasses him or something. Good read. I’ll be sharing this.